Acoustic Guitar Lessons - Fingerstyle. Free Acoustic Guitar Lessons! Fingerstyle, also called fingerpicking, is exactly what it sounds like. Instead of using a pick you use your fingers to play each note. In the free Acoustic Guitar Fingerstyle Lessons I will use the PIMA notation on the tabs. PIMA tells you what finger to use for each note. 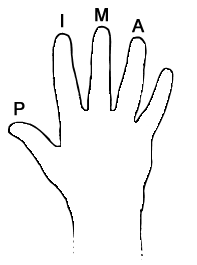 Check out Figure 1 below for finger labels. Note: Figure 1 is looking at the top of your right hand. This is a G Major Fingerstyle Pattern. This is a D Major Fingerstyle Pattern. Here is a G and C fingerstyle pattern. You can also try it with different chord combinations.